The Artist founded in colour theory relates her work towards a level of vibrational energy healing. Colour is a source of energy and is considered to be "light". When light passes through a transparent prism, the light becomes refracted and reveals several bands of colour. Each band of colour vibrates to a specific energy field. Bright colours tend to vibrate towards a higher frequency. These colours make us feel happy and warm. Colour is energy and can uplift and heal the soul of the human spirit. The human body and all living things have an "Aura". This energy field extends outside of the geing and radiates outward. 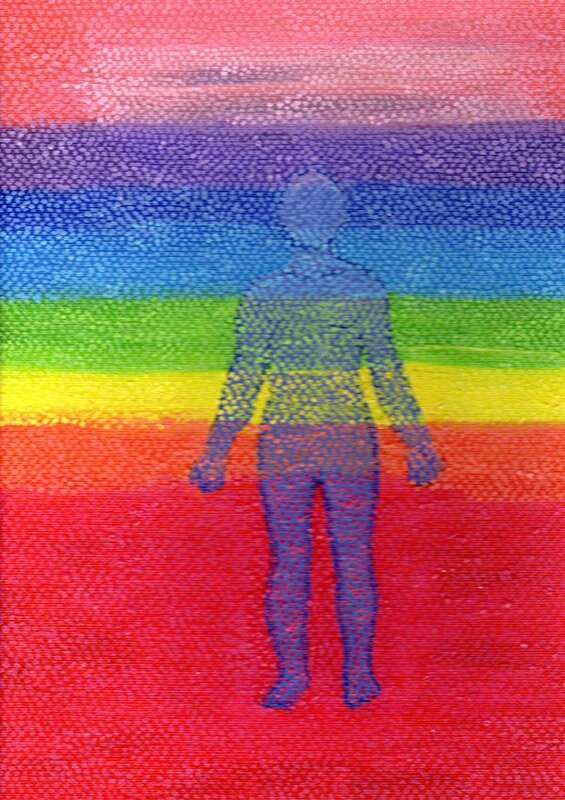 The Aura contains many different colours depending on one’s mood, emotions and personality of the soul. This energy field tends to change, depending on one’s moods and emotions. If a person is angry, the Aura will contain a lot of red. The colour red indicates frustration, anger, passion, vitality and will power. Other colours represent different interpretations, for example-yellow is for upliftment, joy, wisdom and connects with the intellect of a person’s mind. Yellow is related to the sun, its energy source makes us feel warm, happy and revitalising. By introducing the colour yellow to the body this can improve one’s "chi" especially if someone is depressed. The body organs also vibrate to a specific energy field. These energy bands relate to a colour as illustrated in the diagram. The body is a spiritual and is made up of energy. 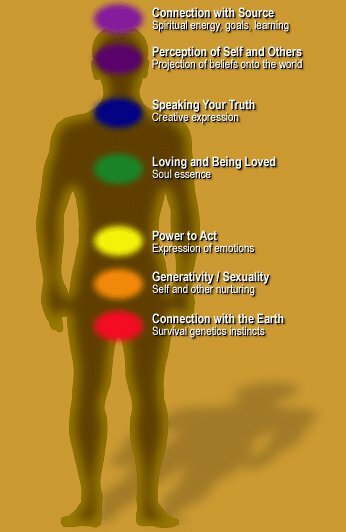 In the body contains seven energy chakras which are called "the Wheels of Life", and theses also vibrate to a specific colour field. 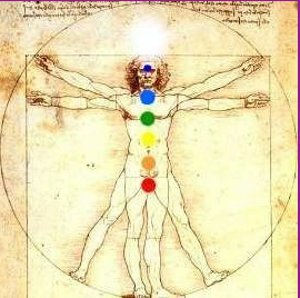 If these energy chakras become blocked, illness prevails and one may feel that the body becomes sluggish and the "chi" level is low. By introducing a level of colour therapy to the body, one may unblock and increase the vibrational energy of the chakra. Thus the "wheels of life" become free flowing, bringing in healing and harmony for the body. Colour Area of the Body. Voilet The Crown of the head , Psychic gateway and Higher Guidance. Pink Angelic realm, intution and guidance. Colour has been around since the birth of the Earth. Without colour, there would be no life. Once colour is studied, the metaphysics of the energy light relates to a world of Ancient knowledge. Colour influences mankind and if implemented properly can bring in healing and harmony for the body, mind and soul. Our environment is precious and needs balance on all levels otherwise the land becomes sick. Today mankind and all living things are experiencing nature’s warning through global warming, earthquakes, droughts, floods, mudslides, volcanic eruptions, cyclones, etc that the Earth is out of balance. Through the Artist’s work, her spiritual message is to bring an awareness of the fragility of nature, the divine light and colour which is so important in today’s stressed society. The Artist continues to work with global organisations such as World Wide Fund for Nature to raise funds and to promote good publicity through her Art. As an artist, her passion is "Nature". It is the beauty of the planet that inspires a translation of colour, light, energy and movement onto the canvas.